Want to improve your health? Adding fresh vegetables to our diets has been shown by researchers to be an easy way to improve our health. In South Texas, this is surely the best time of year to find a wide assortment of locally grown vegetables at our farmers markets, providing us with many beautiful choices. One of my favorite vegetables is beets. A versatile vegetable, beets can be added to a slow cooked pot roast, shaved in salads to be eaten raw or steamed and added to a salad, roasted as a side dish, or added to a power packed vegetable drink. And, the beet greens are just as good for us as the root. Beets come in three different root colors: dark, solid red; a lighter red and white stripped (‘Chioggia’); and golden beets. The dark red type has either green or red leaves and the leaves of the yellow beets are a lighter green. And, with the difference in color, comes slightly different beneficial nutrients with each type. Beets can also be round or elongated in shape. In supermarkets, beets are usually sold in bundles of 3 to 4 roots per bundle with the leafy tops. Beets not only impart color and sweetness to a dish, more importantly, they add nutrients to support healthy bodies, especially our heart, eyes, lungs and digestive system. They are Mother Nature’s buried treasure — a powerhouse of nutrition and flavor. Like other root vegetables, beets are low in calories, but high in complex carbohydrates, fiber, folate and phyto-nutrients. And, because they are good at mining our soils for minerals, they are also high in the essential minerals potassium, magnesium, and copper. The tops, or greens, of beets are also tasty and high in calcium, Vitamin C, Vitamin K and the Vitamin B complex. Beet greens should be sautéed until wilted, taking only about 5 minutes to be ready for the plate. All root vegetables loose nutritional and health benefits from over-cooking. So, for best results, eat them raw, or cut the cooking time wherever you can. One hour in the oven should be sufficient for roasted vegetables and for stews, add them in the last hour. 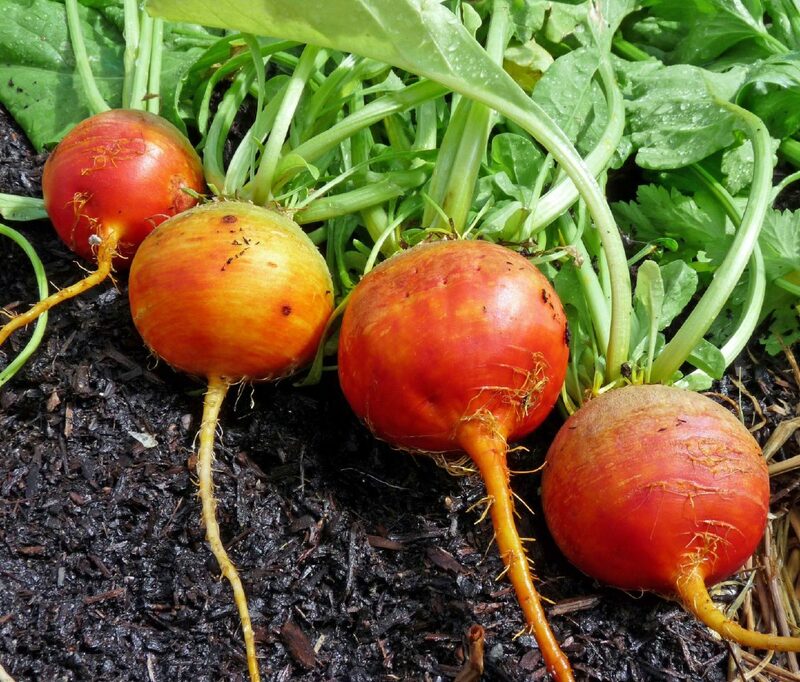 To steam beets, wash the roots, cut them in quarters, leave the skin on and cook for 15 to 20 minutes. Once cooked you can choose to remove the skin or leave it on for extra fiber. It is easy to get a wide selection of beets to improve your health at the Growing Growers Farmers Market today, from 9:00 a.m. until noon. Be sure to stop at the Welcome Desk for beet recipes. This farmers market is located in McAllen’s Firemen’s Park, on the corner of First and Business 83. They also have a beautiful selection of fall vegetables, grass-fed beef, artisan goat’s milk cheese, farm fresh eggs, citrus, jams and jellies, a variety of baked goods, including breads and pies, and natural skin care products. Barbara Storz is a local horticulturist. You can listen to her garden show at 7 a.m. Saturdays on 710 KURV Radio, or reach her through e-mail at bstorz@rcommunications.com.